A happy person who just finished an athletic event right? 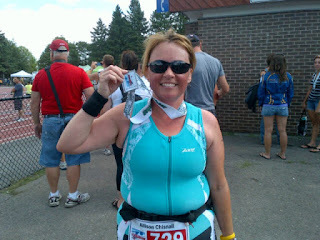 Yes, that is me finishing my first Triathlon in August. When I look at that photo I see the roll of fat above and below my number belt, sad isn't it. Yes I was happy I finally finished a triathlon but I was also sad that even after losing all my weight, I still looked like this. This photo has haunted me for the last few months; it has pushed me to lose more weight this fall. Well now I have started to train for my summer triathlons and I am struggling. Not because I cannot do the workouts but because I cannot do the workouts feeling the way I do right now. I have no energy, I am tired and the spark has gone out. I really want to lose 10 more pounds but even more then that I really really want to do all my events this year, I want to feel better and I want my spark back. I need to fuel my body to do the work I ask of it, you put fuel in a car if you want drive anywhere, otherwise you stand still. It’s simple but so hard at the same time. I went to a blog she recommended and it said to maintain my current weight I need to eat almost double the amount of calories I am eating now, DOUBLE, oh my! I am not quite sure I can do that but I do need to eat more, more good quality food. I knew this, I know this, it’s just hard to believe that you can eat more and not put on weight. What I also realized this week through other peoples comments is that the mirror is a liar, it’s a huge liar and I should not believe it. The mirror does not reflect the beauty inside a person; it does magnifies the tiny flaws we worry about on the outside. The mirror does not show my creativity, my passion, my dreams or my soul but it does have the power to destroy all of them. I will work at not listening to the mirror, the one on the wall and the one on my head, I will eat more to fuel my body to work hard and I will learn to love my rolls of fat in a tri suit, let’s face it, only a stick figure would look good in a skin tight spandex onsie anyway. "The mirror does not show my creativity, my passion, my dreams or my soul but it does have the power to destroy all of them. I will work at not listening to the mirror, the one on the wall and the one on my head"
That statement gave me goosebumps and made me want to cry at the same time...I am picturing your athletic, fit, beautiful self...on a horse like a knight...with a long LANCE Galloping and KNOCKING that self doubt to the ground. Very proud of you...this is very BRAVE stuff :) Letting go and trusting yourself. You should be proud of what your body is capable of, I think it's amazing that you do triathlons!